Temerity Magazine brings you the best worldwide Grizzly Relic & Treasure hunters articles. 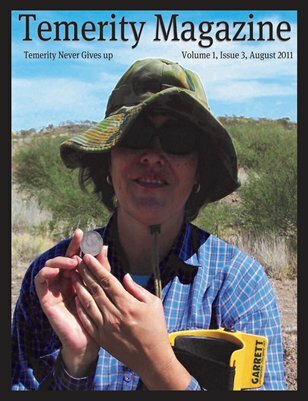 Metal Detecting, Picking garage sales, antiques, bottle digging, gold panning and even meteorite hunting are found 4 times a year between the pages of Temerity Magazine. Colleen McGrath of NQExplorers graces our cover after her husband, Warren submitted this great photo of her holding her great find. The Grizzly Relic and Treasure community is growing and you and your business need to become apart of it! We have two contests for the November Issue SuperJammyGit has given us some Ancient coins to give away to promote Temerity Magazine. Join us and get Grizzly!